If a stranger asked you to invest in his business, the first question you should ask yourself is this: how do I know that I will get my money back? To answer this question, you would want to know the type of business this individual runs, what equipment his company owns in order to make his product or deliver his service, the amount of money he has borrowed from other people, and the amount of money from his own bank account he has already invested in the business. The answer to all these questions will give you a more comfortable feeling about parting with your hard-earned money. A balance sheet will give you some of the answers to these questions. An income statement is another financial statement you should look into when deciding whether to lend money to an individual/company or invest in a company. In this section, we will review both a balance sheet and an income statement. This always holds true because what a company owns (its assets) are purchased by the money the company either borrowed (liabilities) or has acquired through the contributions of the partners (shareholder's equity). The balance sheet is produced based on an idea developed more than 500 years ago called "double-entry accounting" by an Italian mathematician named Luca Pacioli. Double-entry accounting provides an easy way for businesses to keep track of their assets, liabilities, and shareholder's equity. This method of keeping track of a company's activity is called double-entry accounting because at least two types of accounts (categories of assets, liabilities, and equity) are always affected. For example, if a company buys a new car, one type of asset (equipment) goes up, while another type of asset (cash) goes down. Things can get more complicated than this but we hope you understand the basic idea. Balance sheets have dates attached to them because assets, liabilities and shareholder's equity can change every day. So when you see a balance sheet, you will probably also see the date it was created on the top of the table. In all balance sheets, you will find the asset, liability and shareholder's equity categories. However, when you start to look at balance sheets for companies in different businesses, you will see big differences in the details of what makes up assets and liabilities. For example, the assets of a car manufacturer like Ford Motor Company will include the big equipment the company uses to make cars. (See the balance sheet of Ford at the end of this page). But how about a company whose assets is its business know-how? For example, an accounting firm like KPMG, which provides accounting services to big corporations, will have smaller fixed assets than Ford. This is understandable because KPMG does not really manufacture anything. The company simply provides services through its employees--whether it is creating balance sheets for companies or telling companies how to run their businesses better. To bring it closer to home, suppose you started a business where you advise people in your neighborhood on the type of computer to purchase. In this case, your company's asset is you--specifically the information you will provide your customers. Unfortunately, the double-entry accounting method does not have a good way for you to record yourself and your knowledge as an asset on the balance sheet. For this reason, we will concentrate on the balance sheets of manufacturing companies to illustrate the typical corporate balance sheet. As you start getting interested in industries that offer information and business know-how, you can learn about the structure of their balance sheets. This section is just to give you a taste of some of the ways information is presented to you about companies and how you can use the information to help you determine if you should invest or not. 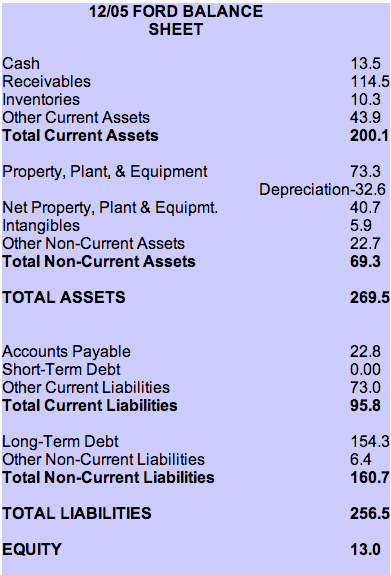 This balance sheet shows that the current assets are made up of: cash in bank accounts; marketable securities--certificates of deposits (CDs); U.S. Treasury Bills and Notes; and others items that can easily be converted to cash; accounts receivable --the amount of money owed to the company for goods sold or services delivered; and inventory--the value of finished goods and raw materials. Fixed assets are made up of: property, plant, and equipment (less depreciation)--buildings, machines, and land used by the company to produce the company's products (see an explanation of depreciation belwo); prepaid expenses--expenses the company pays ahead of time such as rent; patents and goodwill; marketable securities--long-term certificates of deposit (CDs), long-term U.S. Treasury Bills and Notes, and other items that mature in over one year. The typical corporate current liabilities are broken down into three sections: accounts payable--money the company owes for products or services it has purchased; notes payable--money the company has borrowed for a short period of time (usually a year or less); accrued expenses--wages, taxes and other expenses that the company has not yet paid but should pay shortly. Accrued Expenses is worthy of further explanation. This expense item is on the balance sheet because the company will have to pay some expenses every two weeks (wages, for example), every three months (taxes, for example), or every month (rent or leases, for example), but it has to accumulate the expenses before the payment date. For example, if you pay your friend $7 each week, once a week, for a task he helps you do around the house, you will add $1 to accrued expenses on your personal balance sheet each day, until the seventh day when you'd have to pay him. At that time, accrued expenses go back down to zero because you have made the payment. Accrued expenses allow companies to keep track of bills like wages and other items they pay periodically. The typical corporate long-term liability is simply the money owed by the company due in over one year. Remember that this money has been borrowed from lenders who expect to be paid interest on the loan whether the company does well or not. The typical corporate equity amount consists of common stock, preferred stock and retained earnings. Recall that common stock and preferred stock are the money put into the company by investors, and retained earnings are the profit kept by the company (and not distributed as dividends). Depreciation deserves special attention because it is a very important concept in business. It reflects how much of your assets have been used up. The typical balance sheet shows the cost of equipment when it is purchased. But as you know, just about everything looses value the older it is. Depreciation reduces the balance of the equipment to reflect the fact that it is loosing value each year. Depreciation reduces the amount of money a company makes. You will find that what really matters with a balance sheet is how it changes from year to year (or period to period). From this point of view, we will take a look at a few major items on a typical company balance sheet to see how the increase or decrease in balances helps or hurts the company. Cash is the money the company has on hand or in bank accounts. In general, we consider an increase in cash to be a good thing because it can indicate that the company can better withstand hard times when things get difficult. An increase in accounts receivable is not necessarily good news. Recall that accounts receivable indicates the amount of money owed to the company by its customers. A high accounts receivable balance sounds like it might be a good thing until you discover that the company has already claimed that amount as part of its profit. A good example would be if you sold your bicycle to an unreliable friend for $150 but you have not yet received the cash from him yet. On your personal balance sheet, you will have an account receivable entry for $150. Now, you can brag to your other friends that you sold the bike at a good price, but the fact that you have not yet received the money makes your claim questionable because you may never receive that money. Most businesses do the same thing you have done with the sale of your bike. They "brag" (by showing the $150 on a statement that indicates how much money they have made) about their sales, before actually collecting the money from customers. You would expect that if a company's sales were growing, then the account receivables would also grow. In order to tell whether accounts receivable growth is getting out of hand, you should compare it with the growth in sales (which we will talk about in another section of this website). Ideally, the growth of accounts receivable should be less than or equal to the growth in sales. Inventory is the raw materials or the finished goods the company needs to produce whatever it sells. In the SportsTee example, the inventory is basically the raw T-shirts. Increasing inventory is good only if the company expects to make and sell more items in the near future. For the most part, however, increasing inventory levels sometimes signal that the company is not selling enough of the products it makes. An increase in inventory is usually a bad sign. In general, an increasing accounts payable balance can be a good thing because this means that the company is delaying making payments to those it owes money. By delaying payments, it is more or less getting a loan at a low rate for a short period of time. Think of your parents' credit card payments. When your parents use their charge cards to make a $100 purchase, they effectively create an accounts payable of $100 on their personal balance sheet. They will have to pay the credit card company $100 when the bill is due. If they choose to, they can send a $100 check to the credit card company the next day after making the purchase in order to pay for the purchase before the bill arrives at your house. But why should they pay the bill so quickly when the credit card company will probably not bill them for the charge until the end of the month? They can probably use that $100 for their immediate needs and wait for the bill to come. In this way, they are effectively getting an interest-free loan from the credit card company for the number of days it will take for the bill to reach your house. An increasing accounts payable due to the fact that the company can't pay its bills could mean trouble. But this trouble may show up in your current ratio calculation anyway. For a relatively stable company, rising accounts payable is a good thing. Has the company borrowed too much money? There are some tests a beginning investor can easily perform on a company's balance sheet just to see if that company can pay its bills. The first test (Current Ratio) checks whether the company has enough money to pay back debt that is due right away. The second test checks whether the balances of specific items on the company's assets and liabilities are improving or getting worse. Whether the company can pay those it owes money, otherwise known as creditors, depends on how much cash it can get its hands on when the bills are due. Just think of your own personal situation at home. Whether your parents can pay the electricity or phone bill depends on whether they have cash in the bank, whether they can borrow money to pay the bill, or whether they can sell off their assets (such as a car) to gather enough cash to pay the bill. The reality is that your parents can't really depend on selling their car as a way to pay such bills because it may take a long time to find a buyer for the car and negotiate the proper sale price. In short, their ability to pay their bills (a bill being a form of current liabilities) depends on their current assets, and not on their fixed or long-term assets because current assets consist of either cash or assets that can be easily sold off to get cash. In order to determine whether a company can pay its bills, you have to look at the size of its current assets versus its current liabilities. This ratio indicates that current assets are nearly 5 times the size of current liabilities. The way to interpret this current ratio is that SportsTee has about 5 times as much cash and other items it can quickly turn into cash to pay off bills that will soon become due. This figure makes sense only if you compare the current ratios of the same company over a period of time or if you compare the current ratio of different companies in the same type of business. The higher the current ratio, the better. A high current ratio does not guarantee that a company is a winner. It is only one of the indicators among many that can help tell you if the company is worth a second look. Has the Company Borrowed Too Much? The next important question that the balance sheet can answer is whether the company has borrowed too much money. On a personal level, you probably know that it is not a good thing to owe lots of money. For one thing, the bigger your debt, the more of your allowance or salary you would have to use to pay people back. Of course this means you would have less money to spend on the things that are really important to you. Many investors also look at the amount of debt owed by companies to determine whether these companies are good long-term investments. Typically, investors consider the debt-equity ratio, which is simply long-term debt divided by equity (including preferred stock, common stock and retained earnings). Hewlett-Packard Company and General Motors Corporation had debt-equity ratios of .10 and 6.28, respectively, at the time of this writing. As you can see from these numbers, different industries have different standards of how much debt is normal. The computer and electronics business typically has much smaller debt-equity ratios than the automobile business. Therefore, it is important to compare the debt levels in companies in the same industries. In general, however, all things being equal, less debt is better than more debt. We recommend that beginning investors invest in companies that have a debt-equity ratio of less than or equal to .50. If a Teenvestor is interested in an industry that has traditionally high debt-equity ratios, she should choose companies with the lowest debt-equity ratios in that industry. In addition, it is best to calculate a debt-equity ratio over several years to see whether it is increasing or decreasing. It is usually a good thing when debt-equity ratios are going down over time. The balance sheet is only one of the items investors look at when it comes time to evaluating a company to see whether buying its stock will make a good investment. It is probably not the most important tool for looking at all companies. It is fine for looking at some companies that manufacture things, but not necessarily good for looking at companies that provide information because these companies' assets are primarily the "brain power" they offer their customers. For example, the main assets of any newspapers and magazines are its writers who use their intellectual skills to craft good articles. In addition, Internet companies, which offer their technology know-how can't be evaluated simply by looking at their balance sheets. We will discuss how to evaluate such technology companies in a later section.